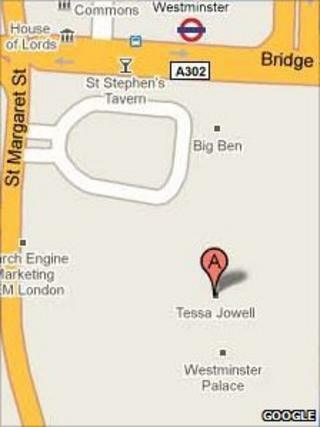 Former Olympics minister Tessa Jowell has appeared as a landmark positioned between Westminster Palace and Big Ben, according to Google Maps. The Dulwich and West Norwood Labour MP said she "was not overly concerned". She added: "In opposition it can often feel like you've been forgotten in the public mind. I'm therefore grateful to Google for putting me back on the map." Google said the data for the website had been provided by a third party. It would not say who that third party was. More than 20 people have so far reviewed the "landmark" and most of the comments were positive. Google user James said it was "a must see‏‏". "For anyone visiting London, Tessa Jowell is one of the finest landmarks the city has to offer," he said. Another website user, Benji,‏ described the landmark as "deeply moving‏". "Tessa is resplendent in the evening light," he said. "Visiting London and watching the sun set over her is one of the most profound spiritual moments I have ever experienced.‏"
But another user called Charles said: "Don't waste time and money on a day out at Tessa Jowell. "Save your money and go off the beaten track to landmarks like Tony Benn or Ed Balls instead."